In my continued search for the Rhode Island equivalent to the world’s best pancakes, we decided to pick a place for brunch this morning. One of our readers had recommended Nick’s on Broadway, which sounded great from the reviews. At 9:30 am this morning, there was already a substantial wait, although that’s not such a bad thing on a warm, sunny day. After about 30 minutes, they offered us three counter seats together where we directly faced the open kitchen. I love this. 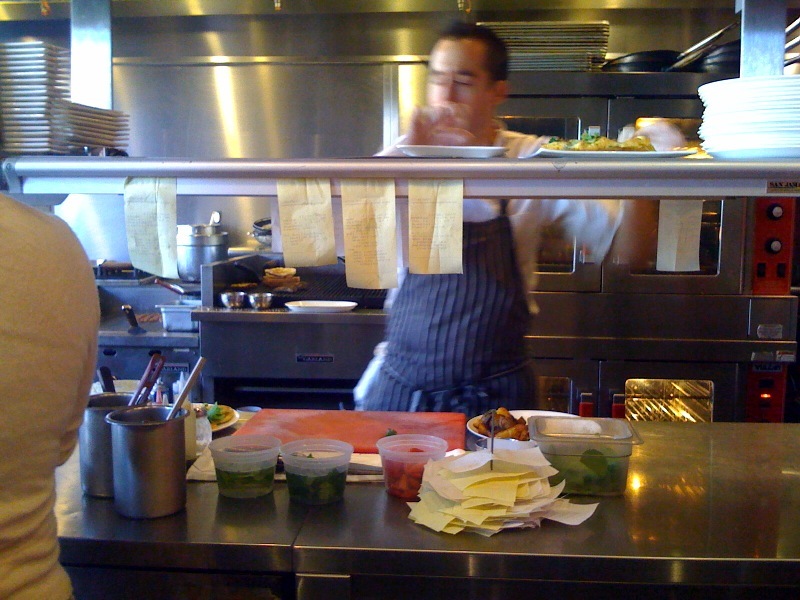 Not only can you see the action, but you can scope out all the dishes and decide what looks good. 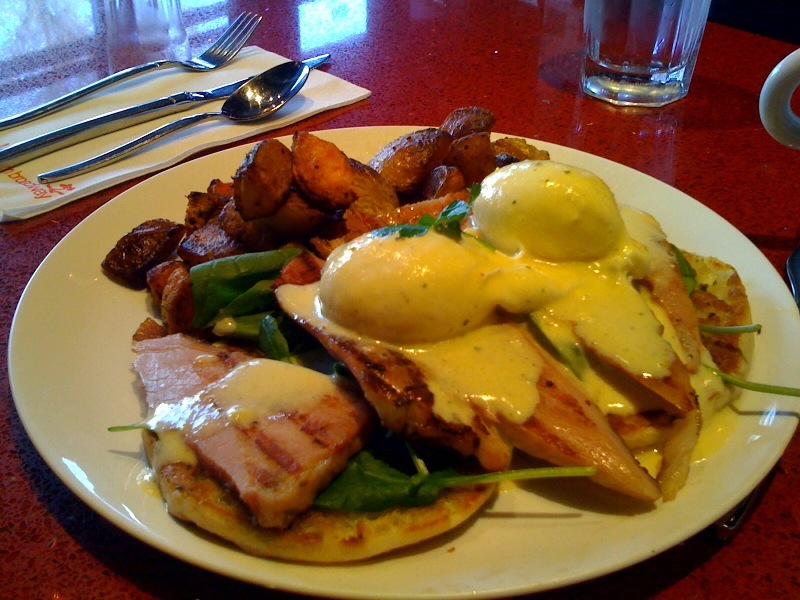 Geoff's breakfast: sliced ham and Eggs Benedict. In my continued search for the Rhode Island equivalent to the world’s best pancakes, we decided to pick a place for brunch this morning. One of our readers had recommended Nick’s on Broadway, which sounded great from the reviews. Although I had planned on pancakes, I knew I wouldn’t be able to resist getting something that came with what appeared to be the best-looking hash browns ever. Luckily Madeline always wants pancakes, so we ordered her a short stack (in the shape of Micky Mouse) so I could try them too, and I chose a bacon and cheese omelet with an english muffin and hash browns. It turned out to be an excellent choice. The omelet had been perfectly cooked (not runny yet no traces of brown), and the hash browns were as good as they looked: a mix of regular and sweet cut potatoes sauteed with red onions. As for the pancakes, they were just okay. It seems they put cinnamon in their batter, a strange choice in my opinion. Madeline didn’t mind, but I, well, you know. We’ll be back, but the quest for the best pancakes must continue.